A general view of Ennistymon Community Centre. Photograph by John Kelly. 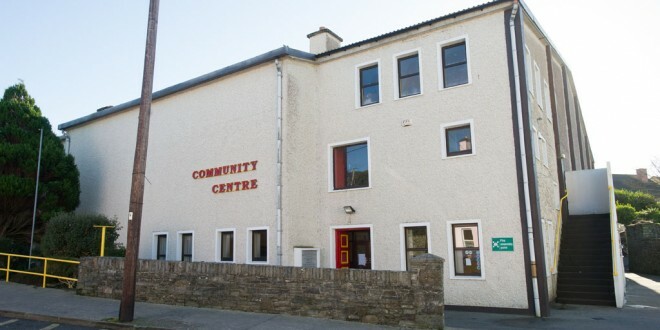 The board of directors of Ennistymon Community Centre will meet next week to discuss the outcome of a public meeting about the centre, which was held in the town earlier this week. According to a statement from the board, its members are “at a complete loss” to understand some of the allegations being made about the centre and its governance. A public meeting was held in The Falls Hotel on Monday, organised by a newly-formed group called the Ennistymon Community Action Group. The group was set up “in response to concerns in the greater parish and community about the current vitality of the Community Centre”. The board of directors of Ennistymon Parish Project Community Centre Ltd did not attend the meeting but refuted claims the centre was unavailable to clubs, that it was alienating young people and that it was not meeting its objectives. The board acknowledged that it had been invited to Monday’s public meeting but declined to go, saying it did not receive the agenda or details of a chairperson in time. Monday’s meeting was described by the Ennistymon Community Action Group as “very constructive” and estimated the attendance at approximately 140. The action group acknowledged the work of the board of Ennistymon Parish Project Community Centre (EPPCC) Ltd and noted that two of the directors had 32 years of service to the company. The condition of the hall, governance of the centre, appointments to the board and funding were all items raised at the meeting. It concluded after a resolution was passed, calling on the directors of the EPPCC Ltd to hold either an annual, or emergency, general meeting of the company at the centre on March 5. The chairman of the community centre board, John Garrahy said the board will meet next week to discuss the meeting’s resolution and plan for its AGM, which, he stated, is usually held in March. Responding to claims, the board outlined the centre’s opening times as being from 7am to 11pm, Monday to Friday; from 8am to 8pm on Saturdays and from 10am to 6pm on Sundays “and after those times by request”. “Absolutely nobody is excluded from the community centre. Everybody is welcome and, to prove that, one only needs to look at the weekly booking sheets. Unfortunately, it is not always possible to satisfy the demand, as the required time slot is already booked,” the board stated, adding that 29 groups used the centre last week, not including casuals or walk-ins. The board “totally rejects the allegation that there is consistent failure by the company to meet its objectives”. “The centre is debt-free and solvent. The existing board do not lack vision, representation, ideas or fear change. They continuously improve, maintain and upgrade the facility,” the board claimed. Members of the public can apply to join the board or be invited on by a board member. These applications or invitations are subsequently “considered and voted on and applicants informed”.